This one hurt as much as George Carlin....wow...I can't believe it! Bernie Mac, who for the past 30 years made the public laugh with an over-sized comic persona in film, television and comedy clubs, has died of pneumonia, PEOPLE has confirmed. He was 50. "[He] passed away this morning from complications due to pneumonia in a Chicago area hospital," his rep, Danica Smith, told PEOPLE. "No other details are available at this time. We ask that his family's privacy continues to be respected." On Aug 1, Mac was admitted to a hospital at Northwestern Memorial hospital with pneumonia said his rep, adding that he was expected to recover, despite widespread rumors about the seriousness of his condition. Born Bernard Jeffrey McCullough in Chicago, Mac began his career as a stand-up comedian in the small comedy clubs of his native town. As a founding member of the Kings of Comedy comedy tour – the success of which spawned Spike Lee's 2000 concert movie The Original Kings of Comedy (also starring Steve Harvey, D.L. Hughley, Cedric the Entertainer) – Mac was able to spotlight what would become his rapid-fire delivery. This effectively launched him into the big time. 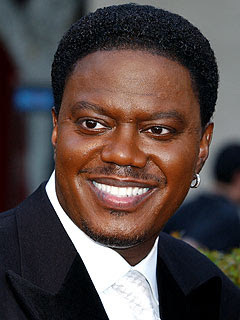 The Bernie Mac Show, which ran from 2001 to 2006, often poked fun of Mac's own life and proved a favorite of both critics and audiences – receiving a prestigious Peabody Award, as well as honors from the Television Critics Association (for best individual achievement in comedy). In addition, the program provided a popular platform for Mac to win consecutive NAACP Image Awards for outstanding actor in a comedy series, from 2003 to 2006. Named top actor in a comedy series at the '06 ceremony, Mac clutched his trophy and reverted to his standup character, declaring: "America, I heard your prayers, and you wanted me here. The Mac Man cometh, and I'm bringing hell with me." He scored on the big screen, too. Among his appearances were those in the comedy Guess Who (as Ashton Kutcher's imposing, prospective father-in-law); the Ocean's 11 franchise; Bad Santa; Charlie's Angels; and Pride, costarring Terrence Howard. This spring, Mac wrapped the upcoming film Soul Men, a comedy costarring Samuel L. Jackson about a former singing duo staging a comeback. He is also set to appear in Old Dogs with John Travolta, Robin Williams and Matt Dillon. He also published a 2001 collection of comic riffs, I Ain't Scared of You and a 2006 memoir, Maybe You Never Cry Again. In February 2005, Mac, then 47, revealed that for the previous two decades he had suffered from sarcoidosis, an autoimmune disease that causes inflammation in organs such as the lungs or lymph nodes. "It has not altered or limited my lifestyle," he said at the time. Since 1977, Mac was married to Rhonda McCullough, with whom he had a daughter, Je'Niece, born in 1978. A graduate of Xavier University of Louisiana (with a bachelors degree in psychology and a masters in mental health counseling), Je'Niece married in 2003 and also has a daughter, Jasmine. His family survives Mac. In 2007, Mac told David Letterman on the Late Show that he intended to retire from standup comedy. "It's going to be 30 years for me, and I'm going to call it," said Mac. "I missed a lot of things, you know. I was a street performer for two years. I went into clubs in 1977." The years of hard work, Mac says, caused him to "miss out on so much, you know, and you live in all these hotels – I was on the road 47 weeks out of the year." As the comedian told Letterman, "I want to enjoy my life a little bit." enjoy my life a little bit." Bernie Mac’s wife and daughter were with him until the very end, says the late comic's sister-in-law in a personal and touching interview with PEOPLE that took place Saturday. Speaking of a heartbreaking moment between her younger sister, Rhonda, and the 50-Year-old actor-comedian – who succumbed to complications from pneumonia in a Chicago hospital at 2 a.m. Saturday – Mary Ann Grossett says that the night before Mac died, "He struggled for his life. He couldn't breathe. "He opened his eyes on his own and looked at Rhonda. She called his name, and he opened his eyes and nodded to her. She smiled at him and told him, 'Don't leave me … 'I'm waiting for you to come back.' He shrugged his shoulders, and she said that's when she knew he was tired. He signaled to her that his body was tired." Rhonda, Mac’s wife since 1977, and their 30-year-old daughter, Je'Niece, 30, were with him when he died. "[The doctors] were working on him," says Grossett. "They tried to resuscitate him two times. One time he came back for about an hour. Then he went into cardiac arrest the second time." Prior to that, the couple had last communicated on July 31. "He told his wife [non-verbally] that he could breathe on his own, and he wanted the ventilator out. He motioned that he wanted it out," says Grossett. The sister-in-law says Mac's inflammatory lung disease contributed to his death. "He had sarcoidosis, but it was in remission," she says. "But because he had it, his immune system was compromised. He had an infection ... He was on a new medication that suppresses the immune system, and that's where the pneumonia came from." "He was critically ill when he was in the hospital," says Gossett. "He was in intensive care the whole time." Of her widowed sibling (like Mac, Rhonda is 50), Grossett says, "She’s devastated. However, she's at peace about his transition because of her faith in God. Her faith is what is sustaining her." She says of the couple's enduring union, "They had 30 years of marriage. That's unprecedented in today's time, particularly for celebrities. That brings joy to her. They loved each other and respected each other on a daily basis. She was by his side to the very end." Recalling the couple's early years, when they were still in their teens, Grossett says, "When they started dating, he said, 'Girl, you better come on board this train, because I'm going to be rich.' And her response was, 'Okay,' and they were married. That's how he charmed her, with his sense of humor." She adds, "When they got married they were kids. He was 20 and she was 19. They both grew up together, and they both matured in this marriage. "What she will treasure the most is the fact that she was his wife for 30 years – and not only was she his wife, but she was his best friend. She's going to miss him dearly." Mac’s funeral is scheduled for Friday, Aug. 15, at an undisclosed location. The family requests that donations be made to the Bernie Mac Foundation for Sarcoidosis, 40 E. Ninth St., Suite 601, Chicago IL 60605.